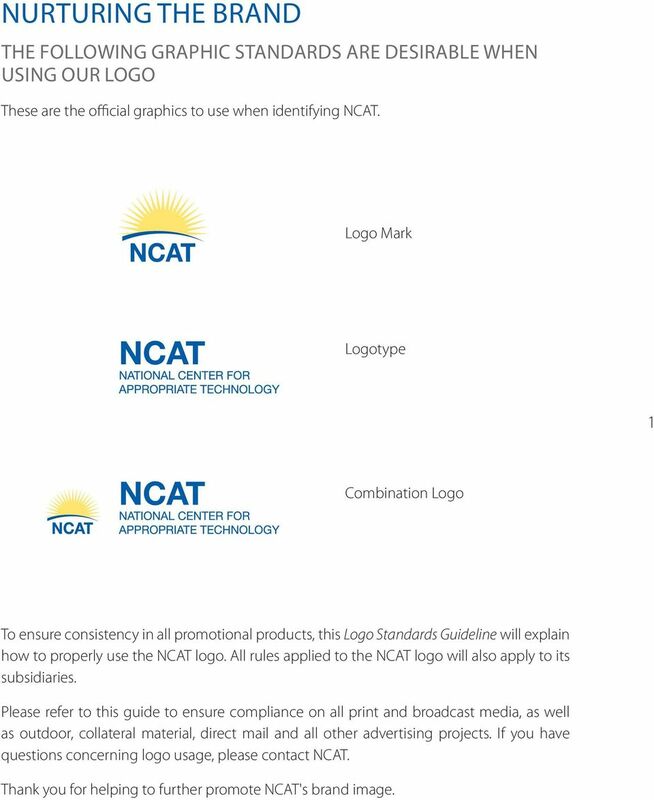 3 NURTURING THE BRAND THE FOLLOWING GRAPHIC STANDARDS ARE DESIRABLE WHEN USING OUR LOGO These are the official graphics to use when identifying NCAT. 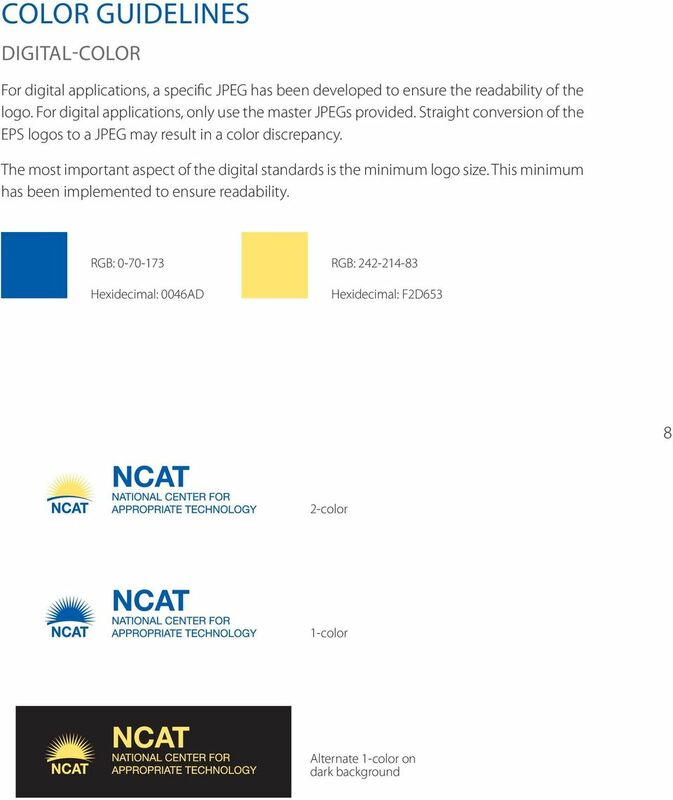 Logo Mark Logotype 1 Combination Logo To ensure consistency in all promotional products, this Logo Standards Guideline will explain how to properly use the NCAT logo. 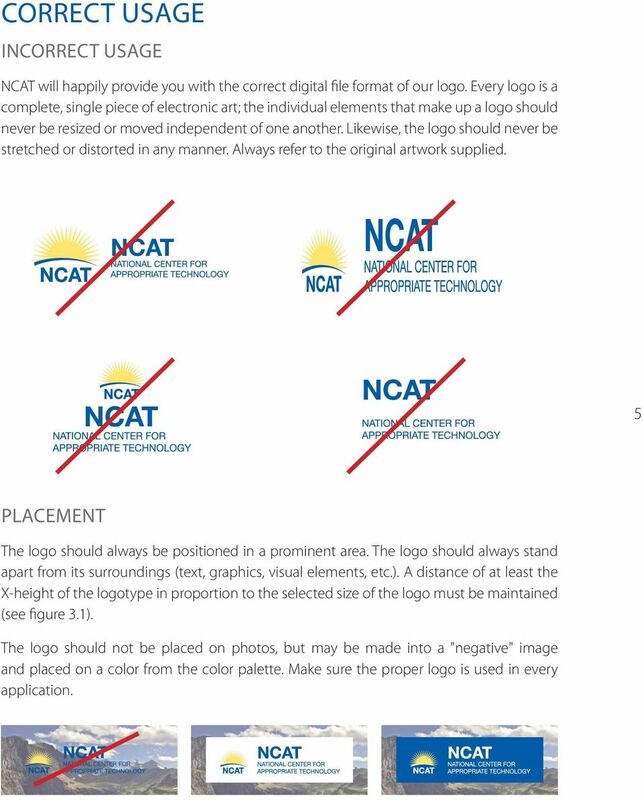 All rules applied to the NCAT logo will also apply to its subsidiaries. 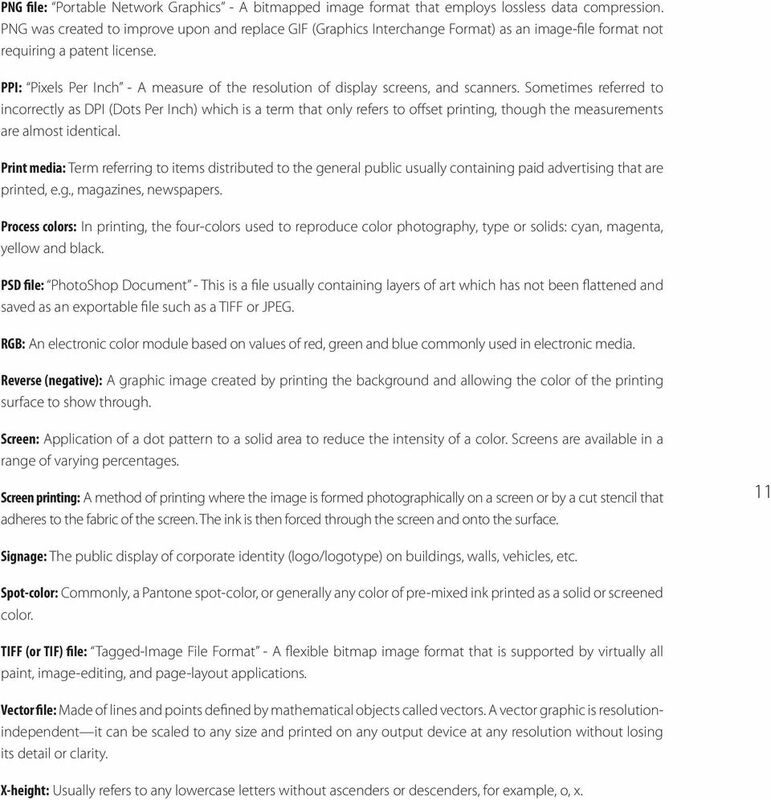 Please refer to this guide to ensure compliance on all print and broadcast media, as well as outdoor, collateral material, direct mail and all other advertising projects. If you have questions concerning logo usage, please contact NCAT. 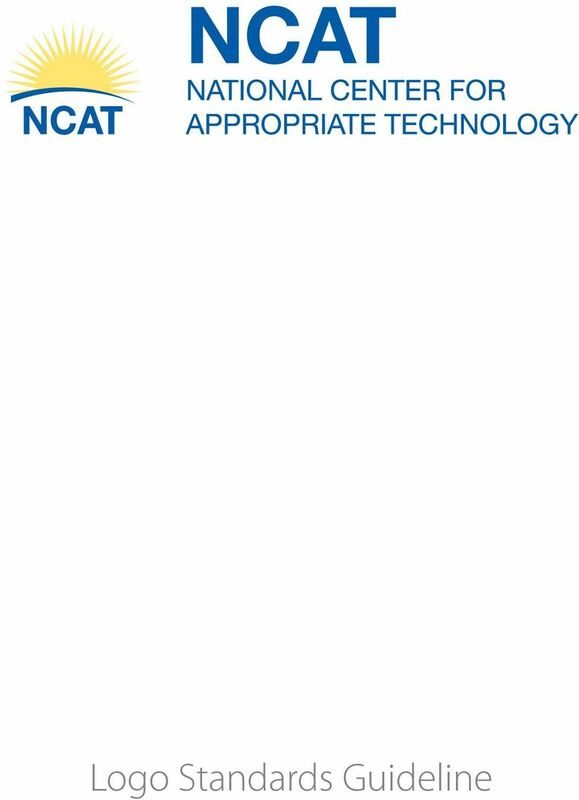 Thank you for helping to further promote NCAT's brand image. 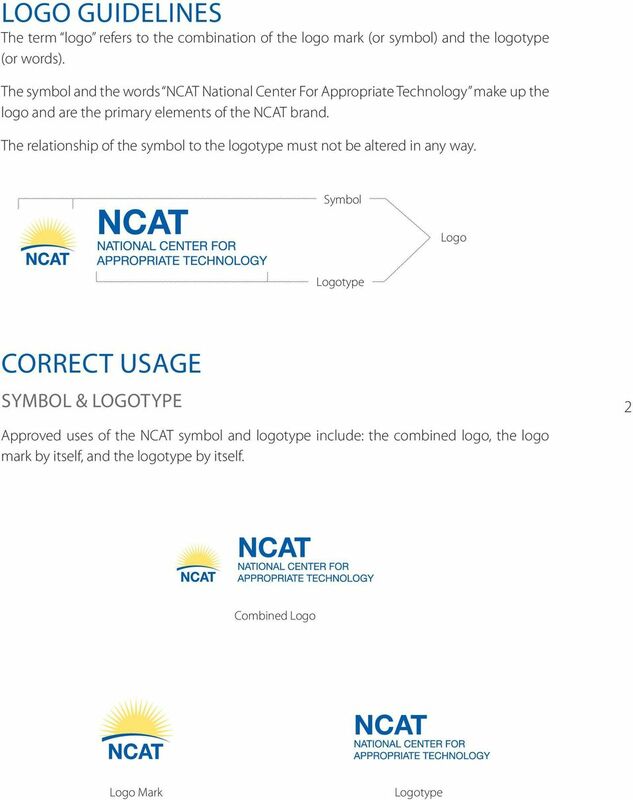 7 CORRECT USAGE INCORRECT USAGE NCAT will happily provide you with the correct digital file format of our logo. Every logo is a complete, single piece of electronic art; the individual elements that make up a logo should never be resized or moved independent of one another. Likewise, the logo should never be stretched or distorted in any manner. Always refer to the original artwork supplied. 5 PLACEMENT The logo should always be positioned in a prominent area. The logo should always stand apart from its surroundings (text, graphics, visual elements, etc.). 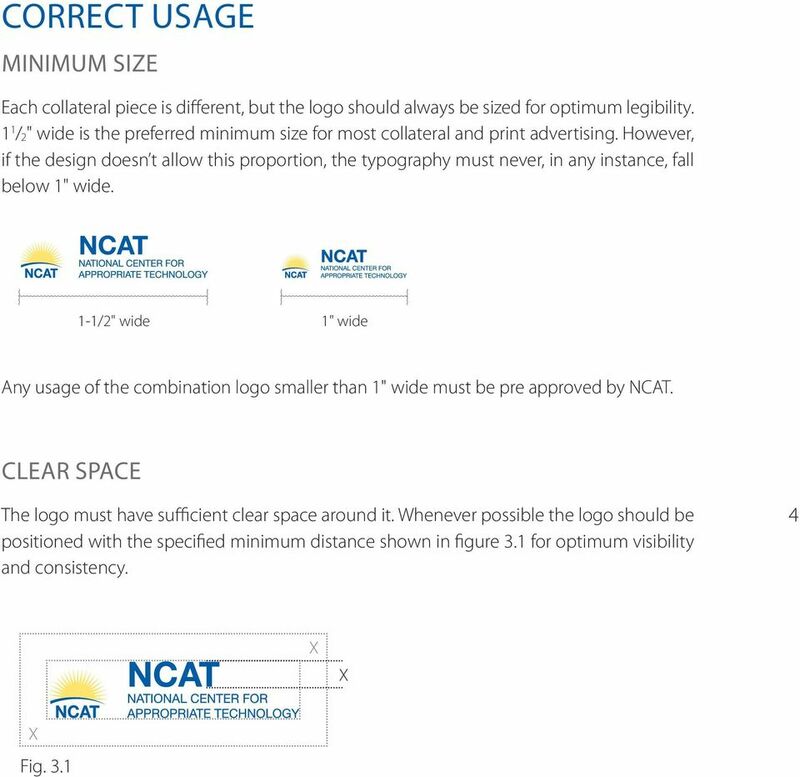 A distance of at least the X-height of the logotype in proportion to the selected size of the logo must be maintained (see figure 3.1). The logo should not be placed on photos, but may be made into a "negative" image and placed on a color from the color palette. Make sure the proper logo is used in every application. 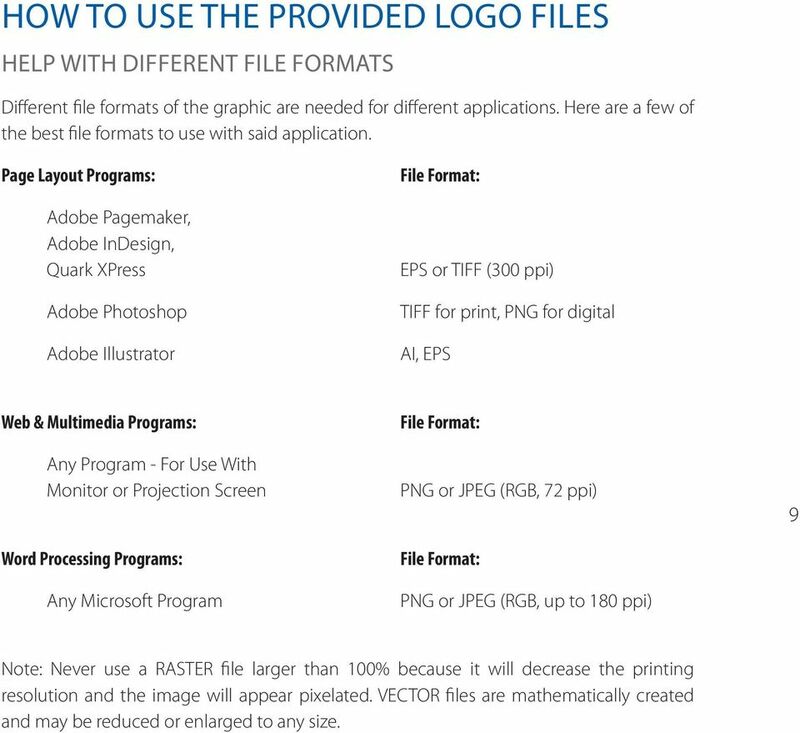 11 HOW TO USE THE PROVIDED LOGO FILES HELP WITH DIFFERENT FILE FORMATS Different file formats of the graphic are needed for different applications. Here are a few of the best file formats to use with said application. Page Layout Programs: Adobe Pagemaker, Adobe InDesign, Quark XPress Adobe Photoshop Adobe Illustrator File Format: EPS or TIFF (300 ppi) TIFF for print, PNG for digital AI, EPS Web & Multimedia Programs: Any Program - For Use With Monitor or Projection Screen Word Processing Programs: Any Microsoft Program File Format: PNG or JPEG (RGB, 72 ppi) File Format: PNG or JPEG (RGB, up to 180 ppi) 9 Note: Never use a RASTER file larger than 100% because it will decrease the printing resolution and the image will appear pixelated. VECTOR files are mathematically created and may be reduced or enlarged to any size. 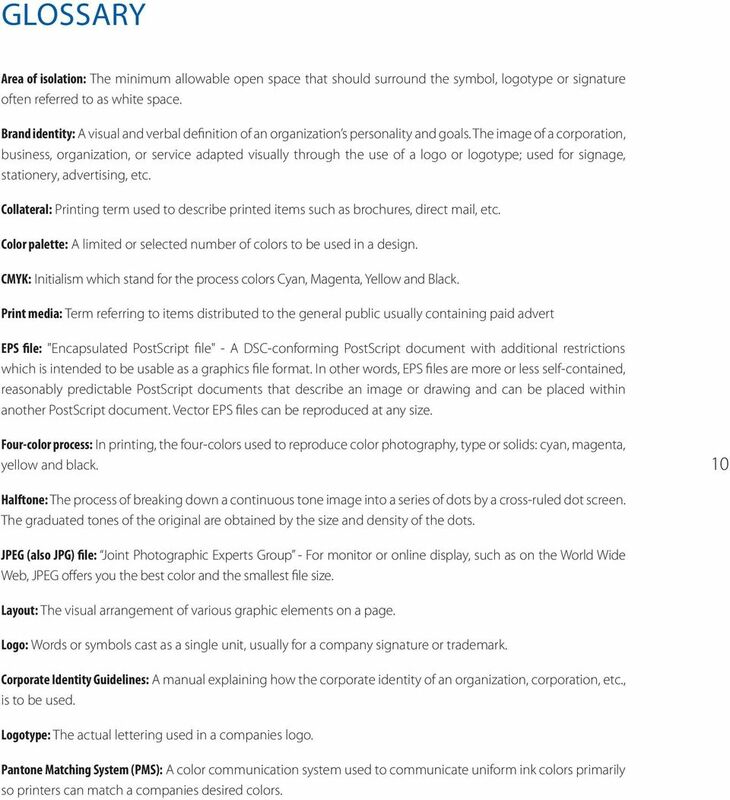 12 GLOSSARY Area of isolation: The minimum allowable open space that should surround the symbol, logotype or signature often referred to as white space. Brand identity: A visual and verbal definition of an organization s personality and goals. The image of a corporation, business, organization, or service adapted visually through the use of a logo or logotype; used for signage, stationery, advertising, etc. Collateral: Printing term used to describe printed items such as brochures, direct mail, etc. Color palette: A limited or selected number of colors to be used in a design. CMYK: Initialism which stand for the process colors Cyan, Magenta, Yellow and Black. Print media: Term referring to items distributed to the general public usually containing paid advert EPS file: "Encapsulated PostScript file" - A DSC-conforming PostScript document with additional restrictions which is intended to be usable as a graphics file format. In other words, EPS files are more or less self-contained, reasonably predictable PostScript documents that describe an image or drawing and can be placed within another PostScript document. Vector EPS files can be reproduced at any size. Four-color process: In printing, the four-colors used to reproduce color photography, type or solids: cyan, magenta, yellow and black. 10 Halftone: The process of breaking down a continuous tone image into a series of dots by a cross-ruled dot screen. The graduated tones of the original are obtained by the size and density of the dots. JPEG (also JPG) file: Joint Photographic Experts Group - For monitor or online display, such as on the World Wide Web, JPEG offers you the best color and the smallest file size. Layout: The visual arrangement of various graphic elements on a page. 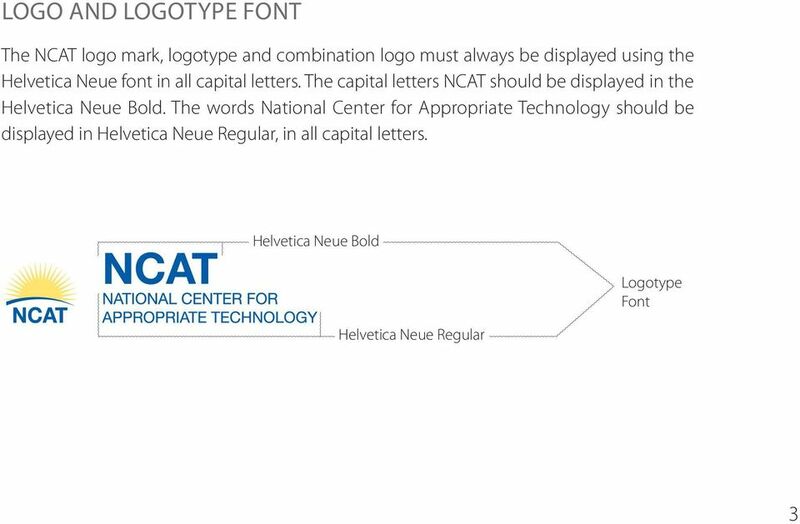 Logo: Words or symbols cast as a single unit, usually for a company signature or trademark. 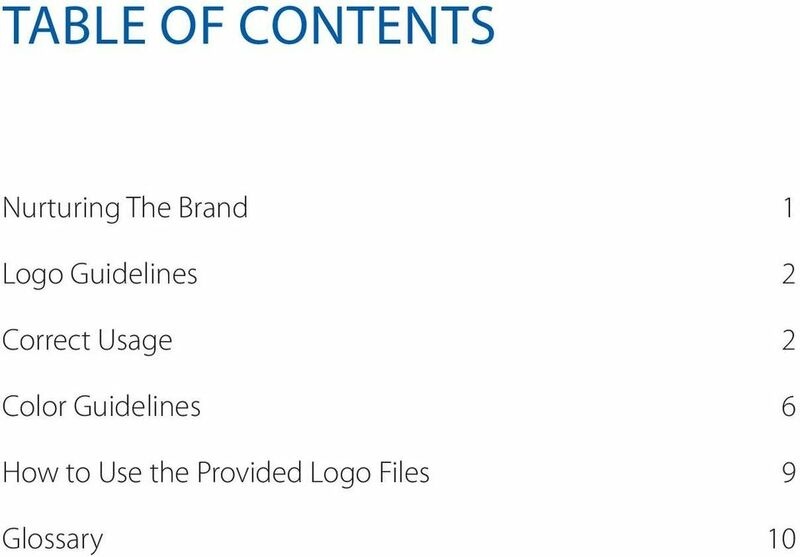 Corporate Identity Guidelines: A manual explaining how the corporate identity of an organization, corporation, etc., is to be used. Logotype: The actual lettering used in a companies logo. Pantone Matching System (PMS): A color communication system used to communicate uniform ink colors primarily so printers can match a companies desired colors. 13 PNG file: Portable Network Graphics - A bitmapped image format that employs lossless data compression. PNG was created to improve upon and replace GIF (Graphics Interchange Format) as an image-file format not requiring a patent license. PPI: Pixels Per Inch - A measure of the resolution of display screens, and scanners. Sometimes referred to incorrectly as DPI (Dots Per Inch) which is a term that only refers to offset printing, though the measurements are almost identical. Print media: Term referring to items distributed to the general public usually containing paid advertising that are printed, e.g., magazines, newspapers. Process colors: In printing, the four-colors used to reproduce color photography, type or solids: cyan, magenta, yellow and black. PSD file: PhotoShop Document - This is a file usually containing layers of art which has not been flattened and saved as an exportable file such as a TIFF or JPEG. RGB: An electronic color module based on values of red, green and blue commonly used in electronic media. Reverse (negative): A graphic image created by printing the background and allowing the color of the printing surface to show through. Screen: Application of a dot pattern to a solid area to reduce the intensity of a color. Screens are available in a range of varying percentages. Screen printing: A method of printing where the image is formed photographically on a screen or by a cut stencil that adheres to the fabric of the screen. The ink is then forced through the screen and onto the surface. 11 Signage: The public display of corporate identity (logo/logotype) on buildings, walls, vehicles, etc. Spot-color: Commonly, a Pantone spot-color, or generally any color of pre-mixed ink printed as a solid or screened color. TIFF (or TIF) file: Tagged-Image File Format - A flexible bitmap image format that is supported by virtually all paint, image-editing, and page-layout applications. Vector file: Made of lines and points defined by mathematical objects called vectors. A vector graphic is resolutionindependent it can be scaled to any size and printed on any output device at any resolution without losing its detail or clarity. X-height: Usually refers to any lowercase letters without ascenders or descenders, for example, o, x.
American Mathematical Society. Naming Files File names should be no longer than 20 characters, including an extension. Get the Best Digital Images Possible. What s it all about anyway?